Peter3 Dougall (George2, John1, ThomasA, JohnB) was born 5 December 1855 in Montreal and baptized 13 January 1856 at Erskine Presbyterian Church, son of George and Agnes (Moffat) Dougall. He died 27 December 1939 at Pembina, Manitoba. 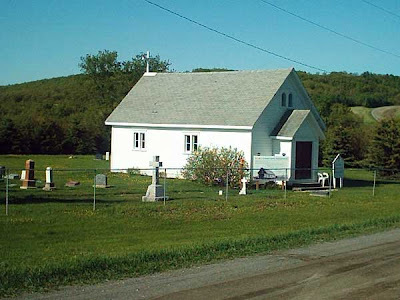 He is buried at St Lukes Church cemetery, Pembina. On 9 March 1882 in Montreal, Peter married Helen Anderson, daughter of the late George Anderson and his widow Agnes; Helen predeceased Peter on 16 October 1935. Peter was said to be a naval engineer with the Merchant Marine for some years and then migrated to Manitoba in 1880 to farm. His location on both east quarters of Section 22, township 2, range 9 west was nearby that of his older brother James Joseph. Peter returned to Montreal to marry, as did his brother, between filing his land claim and receiving the 1886 patent for it. In 1881, Peter was enumerated with brother James, both single farming men. Ten years later, he is with his wife and son, next to the Lea relatives of my correspondent Felix Kuehn. Peter's father George likely also assisted his youngest son in building a new frame home of Peter's own design. The tall narrow section featured interior window seats for a fine view over the valley and his property known as Kirkland Farm. Although not clearly discernible, I would say the Dougalls posed for the photograph, with Helen in the garden she was planning and Lorne on the porch, assuming the man in front is Peter. Helen was probably well-educated; she was one of the founders of the Pembina Crossing Literary Society. She brought expensive wedding gifts with her from Montreal, possibly also inheriting resources from her father. Their home was furnished with many framed oil paintings, fine china, and a grand piano. Yet the couple led unpretentious, hardworking lives, generally acknowledged as exemplary and hospitable Christians―"incorruptibly faithful in their attendance at church." The year 1902, about the time Peter was completing his new house, saw a solid step toward a momentous religious transition in Canada. Some would call it disruption. Formal talks were begun to unite three different faiths: Presbyterians, Methodists, and Congregationalists (it was not until 1925 that the United Church of Canada was officially formed). Many Presbyterians were against the idea of merging with Methodists, including our western Dougalls. 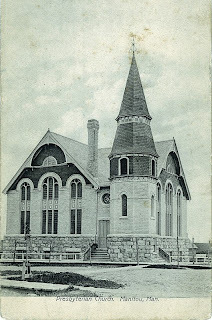 Their early church building was shared with a Methodist congregation on alternate Sundays. 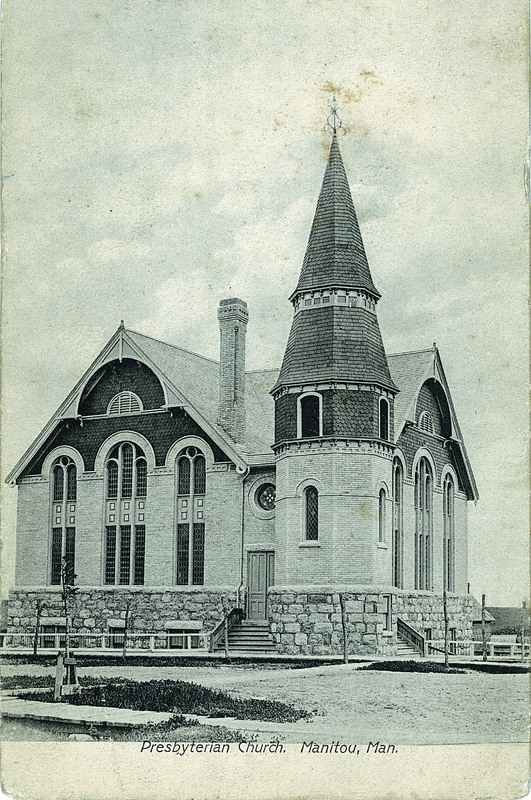 Then a large new Presbyterian church was built at Manitou just after the turn of the twentieth century; Peter Dougall became an elder. The incumbent of the new church spoke in favour of union, quickly falling out of favour with some parishioners who resisted. Dr. Matthew Young, friend of the Dougalls and great-grandfather of Felix Kuehn, was one who made his objections plain. Eventually each church congregation in the nation voted whether to join the United Church merger or not. When his church voted to join, Peter Dougall switched his worship to St Luke's Anglican Church at Pembina Crossing. He went so far as to stipulate he would not be buried at the Manitou church, therefore he and his family lie in St. Luke's churchyard. This is indicative of how strong the feelings ran; although solid numbers of Presbyterians overall embraced the merger, it was difficult for many members to accept the change, especially if they felt bereft of the local church they loved. Nonetheless, the Presbyterian Church in Canada still remains a stalwart, separate entity. i. GEORGE LORNE4 DOUGALL was born at Manitou, Manitoba on 30 June 1883. He died, unmarried, before 1971 in LaRivière, Manitoba. Lorne maintained the family farm throughout his lifetime except for draft service in the Canadian army from July 1918 until his discharge in November 1919. His parents commissioned an oil portrait of teenaged Lorne in Highland dress, by a Montreal artist. He befriended local natives, having a great interest in Indian lore, collecting artifacts unearthed while ploughing. Much of his collection later went to friends and neighbours; his cousin Agnes believed the Manitoba Museum acquired some pieces--this last has not yet been verified or not. .
My thanks to Felix Kuehn who considerably enlightened me on a corner of Manitoba history! "Quebec, Vital and Church Records (Drouin Collection), 1621-1967," digital image, Ancestry.ca (www.ancestry.ca : accessed 20 August 2013); Peter Dougall baptism, Erskine Presbyterian Church (Montreal, Quebec), 1856, folio 2. Peter Dougall, Manitoba death registration no. 39-06-048423 (1939), Manitoba Department of Health, Pembina division. Further information in undated newspaper clipping kept by Agnes B. Dougall. Felix Kuehn to Brenda Merriman, email, 2 February 2013. "Quebec, Vital and Church Records (Drouin Collection), 1627-1967," digital image, Ancestry.ca (www.ancestry.ca : accessed 8 August 2013); Dougall-Anderson marriage, Erskine Presbyterian Church (Montreal, Quebec), 1882, folio 7. "Deaths," database, Manitoba Vital Statistics Agency (vitalstats.gov.mb.ca : accessed 20 August 2013), Helen Anderson Dougall, death registration no. 040416 (1935). "Western Land Grants (1870-1930)," database, Library and Archives Canada (www.collectionscanada.gc.ca : accessed 15 August 2013), citing microfilm C-5958; Peter Dougall, SE part section 22, township 2, range 9W, 12 January 1886. A separate patent was issued for the NE quarter. 1881 Census of Canada, Manitoba, district 186, Marquette, subdistrict 3, Mountain, p. 6, Peter Dougall; digital image, Ancestry.ca (www.ancestry.ca : accessed 19 August 2013), from Library and Archives Canada (LAC) microfilm C-13283. 1891 Census of Canada, Manitoba, Selkirk District, subdistrict Louise, division 2, p. 16. Peter Dougall; digital image, Ancestry.ca (www.ancestry.ca : accessed 19 August 2013), from LAC microfilm T-6295. Felix Kuehn, Departed Leaving Footprints in the Sands of Time, Chaper XI, "Our Noble Neighbours," p. 9. Kuehn, op. cit., p. 9 note 27. George Lorne Dougall, Manitoba birth registration no. 003913 (1883); database, Consumer & Corporate Affairs, Vital Statistics (http://web2.gov.mb.ca/cca/vital accessed : 10 April 2007). Note the more recent change of the database title as per Note 5. Family information. Manitoba death registrations are available only when seventy years have passed. “Particulars of Recruit,” service no. 528576 JO, 30 June 1916, digital image, Canadian Genealogy Centre (http://www.collectionscanada.gc.ca/genealogy/index-e.html : accessed January 2007). Kuehn, op. cit., p 11. The portrait devolved into the possession of Felix's family but was destroyed in a house fire in 1976. Dougalls: it's been a while, I know. Updating the Dougall family history as per my 2011 publication means, for me, drafting the new information as a blog entry. It's preparation for tackling the manuscript as a whole. Thanks to Felix Kuehn and his great-grandfather, Dr. Matthew Young, I can do this for two branches. Felix is unrelated to me but a marvellous chronicler of pioneer families in the McKenzie District of southern Manitoba. Felix willingly shares, and we have had many pleasant mutual exchanges. My new material is heavily indebted to him. 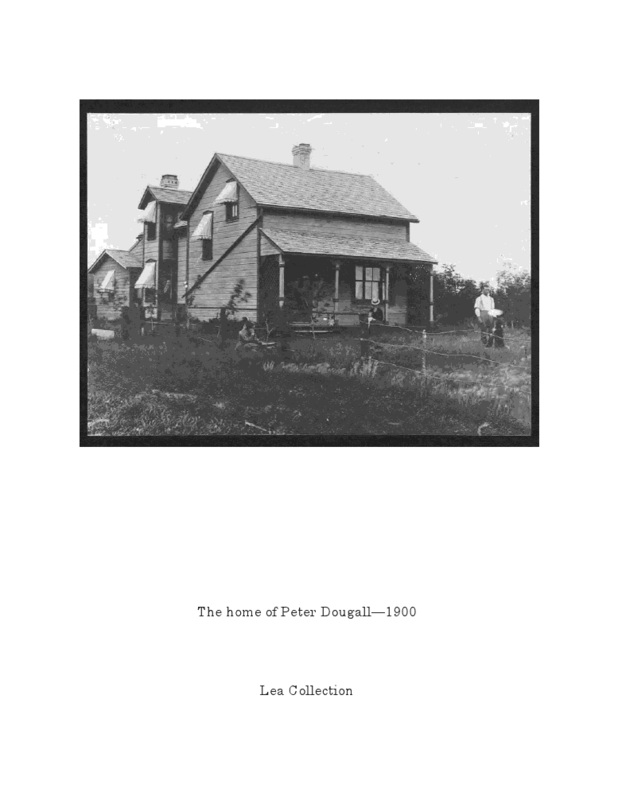 Many Dougalls went west from their birthplaces in Quebec. They shared the same emigrant Scottish grandparents as my own ancestor, William Charles Dougall (1854-1934) who also moved west to Winnipeg. Thus, cousins all, and the first generations to be born in Canada. Here I dwell on two of them—one couple as they were. Some of the source citations dating from years-ago cooperative family research have not been updated yet. To my great surprise and delight, Felix brought to my attention a diary written by one Dougall, of his journey into the "Great Northwest." In his memoirs, Dr. Young quotes entries from April 22nd when the adventurers headed north from the border town of Emerson, Manitoba, up to May 28th. It's not yet clear if more description exists before that date, for example, details of the travel between Montreal and Emerson. James Joseph3 Dougall (George2, John1, ThomasA, JohnB). Probably born in 1847, he was baptized 12 September 1847 in Montreal, son of George Dougall and Agnes (Moffat) Dougall. He died in West Kildonan, Winnipeg, Manitoba, on 17 May 1940. 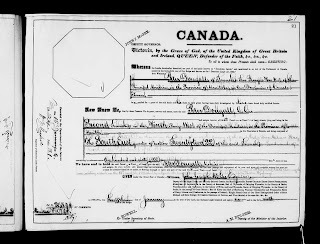 James J. of Pembina Crossing, Manitoba, married 28 February1883 in Montreal his first cousin Ellen Dougall of Farnham Centre, Quebec, the sixth daughter of his uncle James and Agnes (Fenton) Dougall. Ellen was born at Cowansville, Quebec, 8 February 1856 and died in Winnipeg in 1949. Both are buried in the Manitou Cemetery, Manitou, Manitoba, along with their two daughters. James J. Dougall was occupied as a carpenter in the 1871 census, in his father's household. It was another eight years before he and a group of like-minded friends decided to head for the Pembina River Valley of Manitoba. Jim, as he was known, wrote a diary about the 1879 journey and obtaining his land claim. The diary records the obstacles these hardy men faced as they explored almost virgin territory; even reaching the land office at Nelsonville was hard work. So much distance to cover and so few habitations. Fertile as it is, Manitoba mud is legendary for its impediments to man, beast, and vehicle. Jim mentions the hardships of reaching each point of reference, sometimes "to the knees in mud and water―a dreadful experience," broken carts, having enough supplies for rough camping, swimming oxen across a river, getting lost, how some discouraged men bowed out. It snowed on April 26th! Returning to Nelsonville, on 7 May 1879 he filed for part of section 16, township 2, range 9, on the west bank of the Pembina River. It was May 28th, the last available diary entry, when Jim reached his homestead property again with the necessary goods and livestock. A log house would be the first priority, a location chosen on the crest of an imposing hill with a splendid view of the valley, a home to be named "Hillside." Four years later at the age of thirty-six, having accomplished his main goals, he returned to Quebec to marry his cousin. We wonder: being city-born and -bred, did Jim have any experience at farming? The suspicion is that as a teenager/young man, he spent summers at his grandfather's farm at Beech Ridge near St. Andrews East, Quebec―he speaks knowledgeably about soil in the diary. Whatever, this was a versatile family. 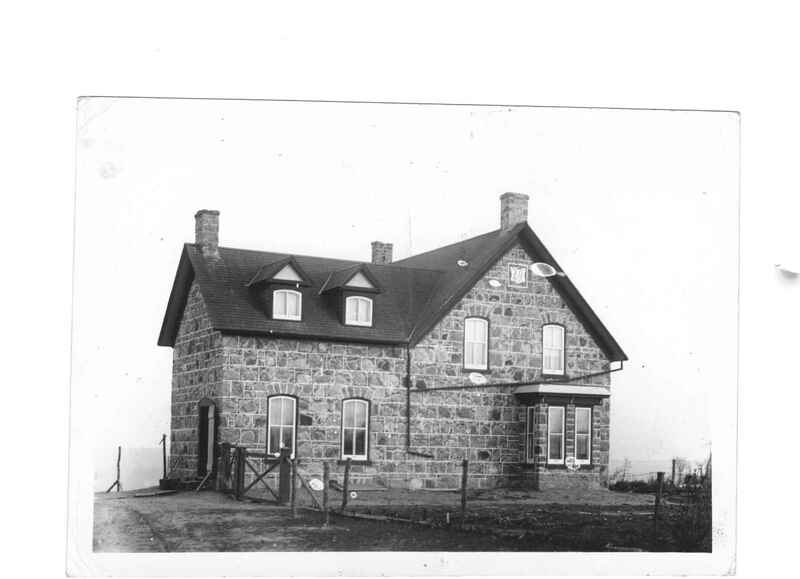 His father George—a tailor in Montreal—was definitely involved to some extent with his parents' farm. In fact, after his wife died and beginning in 1888, George travelled west many summers to assist his son in preparations for a fine stone house. Felix worked with the memoirs of Dr. Young―also a pioneer, and good friend and neighbour of Jim Dougall―and other neighbours' recollections to bring a voice to early Pembina Crossing days. Regarding the James J. Dougall home, great credit goes to his father George Dougall ... "a tailor who in his retirement takes up the art and craft of a stone mason. Although he was eighty-two years of age when he undertook to assist his son in the building of a new home, he was still perfectly capable of spending a day swinging a three-pound stone mallet." A man of amazingly good health and possessing a constitution which allowed him take undertake any line of work that a man half his age could manage, I must especially write of his labours during the summer of 1900, vacation months which he spent almost entirely breaking rocks. ... With the assistance of his hired man, Jim Dougall dug out and hauled to his house yard several hundred tons of stone. These were carefully inspected by his father, who selected those displaying the best graining and finest colour. These he set out to split into pieces of appropriate size for the construction of his son's new home. In consideration of the fact that he had passed the biblical span by more than a decade, the elder Mr. Dougall was persuaded to make a single concession. When possible to do so, instead of straddling the stone he was drilling, he settled himself in his son's favourite rocking chair, an arrangement which allowed him to spend his normal eight-hour day without undue strain or unnecessary fatigue. Of course, I would not like anyone to think that breaking rocks for his son's home occupied him for the entire summer, for that was not the case. He also dug a drain for the sinks in the house from the kitchen to the top of the hill, a distance I should think of about thirty feet, two feet wide and six feet deep. Of course, this also occupied him for a number of days. The photo of George (1818-1904) is from the Peter Smith family. Alas, no photo of James Joseph "Jim" Dougall. The Jim Dougalls were well-known for their gracious hospitality and Mrs. Dougall for her excellent cuisine [and] exquisite desserts which graced the table. The Dougall home was one of the first places in our district where one could enjoy an apple pie made with apples grown in the family's own orchard. An old paper from the summer of 1898 notes that a single apple tree in his orchard had produced two hundred and eighty fine apples! The couple had two spinster daughters, who became school teachers. Eventually they rented their farm out and moved to 125 St. Anthony Avenue, Winnipeg. Agnes cared for her elderly parents in their final home and loved to keep in touch with her extended family by letter-writing. When Agnes died in 1967 it was the end of this Dougall branch. Agnes was a going concern and deserves her own biography. 79. i. AGNES BENNING4 DOUGALL, 1884-1967. 80. ii. ELIZABETH JANE DOUGALL, ca.1885-1945. One of Jim's younger brothers, Peter, followed him to Pembina Crossing, and will be my next Dougall subject. Erskine Presbyterian Church (Montreal, Quebec), baptisms. Originally researched by Salli Dyson, the church registers are now available (and the baptism confirmed) in Ancestry.ca's "Quebec, Vital and Church Records, (Drouin Collection)." Manitoba death registration no. 020420 (1940), Manitoba Department of Health, West Kildonan division. Also “Mrs. James J. Dougall,” unattributed newspaper clipping, undated, referring to husband James J’s death in 1940. "Quebec, Vital and Church Records, (Drouin Collection), 1621-1967," digital image, Ancestry.ca (www.ancestry.ca : accessed 2 August 2013); Dougall-Dougall marriage, East End Methodist Church (Montreal, Quebec), 1883, folio 5. Ellen's baptism eludes me in the Drouin Collection, although Salli Dyson apparently saw the church record. Felix Kuehn to Brenda Merriman, email, 5 February 2013; Manitoba death records are not available until 70+ years have passed. 1871 Census of Canada, Quebec, District 106, Montreal, St. Antoine Ward, subdistrict B, division 2, p. 83. George Dougall household; digital image, Ancestry.ca (www.ancestry.ca : accessed 9 October 2010), citing Library and Archives Canada microfilm C-10046-10047. The diary is quoted in Felix Kuehn's work in progress, Departed Leaving Footprints in the Sands of Time, Chapter XI, "Our Noble Neighbours," pp. 2-5. Felix grew up in the neighbourhood, collecting tales of ancestors and their friends. Diary excerpts have also been previously quoted in some histories of Manitoba. "Western Land Grants (1870-1930)," database, Library and Archives Canada (www.collectionscanada.gc.ca : accessed 15 August 2013), citing microfilm C-5942; James Joseph Dougall, NE part section 16, township 2, range 9, W1; no image or date. "Our Noble Neighbours," p. 6. "Our Noble Neighbours," pp. 6-7. What is it, you ask? It's part of a Tunisian marriage contract for a nineteenth century Ottoman family. Displayed in Dar Essid, Sousse, Tunisia. No transcription available! The once-luxurious home is stuffed with sadly decaying historical artifacts.